And as Christmas Day starts to wrap up, I move on to the Marvel properties and share my wish list villain for Marvel’s Agents of SHIELD. The show spent a lot of time with Hydra and the Inhumans, and we’re really looking at the Inhumans again here. But season four brought us Ghost Rider, the Darkhold and LMDs, so I have hope that they’ll dive into more of SHIELD’s past and bring us the Zodiac Cartel. 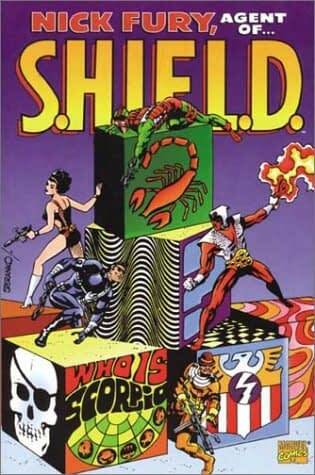 Back when SHIELD focused on Nick Fury and was essentially a James Bond-style spy thriller, he went up against a group called the Zodiac Cartel — which had a few interesting surprises. They first appeared in Avengers #72 (1970) by Roy Thomas and Sal Buscema, and while they took on the likes of the Avengers, Daredevil and Iron Man, their best use was up against Nick Fury. While the team was founded by Cornelius van Lunt, who took the name Taurus, the biggest surprise came when Scorpio was given the Zodiac Key and sent to kill Fury — except Scorpio was actually a rogue LMD of his brother, Jake. He took out Scorpio and then impersonated him, allowing Nick to infiltrate the cartel. This was classic spy stories. Though the cartel is made up of criminals and business men, they would often get their hands on powerful devices like the extra-dimensional powered Zodiac Key or the stellar energy device called the Star-Blazer. Other than that, these were thugs, the type of characters that are a good match for the non-powered characters like Coulson, Mac, Fitz, May, and Simmons. The series has embraced the more superhero aspects of the universe with characters like Quake, Slingshot, and Ghost Rider, but some of the best moments in the first few seasons where when it was being a spy thriller. And since the show tends to re-invent itself every seven or eight episodes now, it would be nice to see them return to that style of show for a few episodes at least.